Destiny's Grace is a story that goes beyond infatuation and strikes a timeless cord that resonates in the soul. Set in Atlanta, it is the final installment in a trilogy. Candance has said yes to Derrick's marriage proposal, but because love isn't the only reason they're getting married, problems arise. It is only through death they are able to realize that it was fate that joined them and only true love which will keep them together. The novel, as well as the story of Candace and Derrick, ends with them at a pulpit in front of a preacher fulfilling Destiny's Grace. Stormy Weather Friends is a real and heart felt story set against the ambiance and excitement of the Big Easy. The story centers on Bryon Wolfox and Kaya Bolden, and is a jazzy roux of passion, reality, and possibilities. Bryon is an artist and Kaya's frame fits his tapestry perfectly, but even though they try to dig deeper than the canvas, their passions somehow get in the way. However irony has a way of rewarding the faithful and even though the story ends with them saying goobye, they find that by being Stormy Weather Friends, they can share a love affair that is eternal. 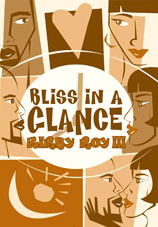 Bliss In A Glance, is the tale of Candance Johnson and Derrick Alexander. They haven't been in love long, so the excursion on which they are about to depart is the perfect way for them to address the issues hovering over their union. The story combines a mixture of passion and intrigue with the issue of Candance possibly changing their relationship by moving to a different city. Set in Washington D.C. the tale asks whether or not circumstances can extiguish the flame between lovers.